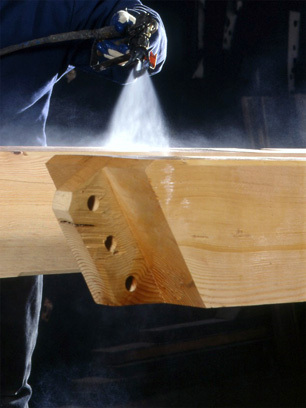 PCP is used primarily as a fungicide in wood treatment. Pentachlorophenol (PCP) is an organic chemical used primarily as a fungicide to preserve wood. It has also been used as an herbicide, a disinfectant and in leather and textile applications, though these uses have been banned in the United States since 1987. PCP generally arrives in drinking water through runoff from wood treatment factories. Some people who drink water containing pentachlorophenol well in excess of the maximum contaminant level [0.001 milligrams per Liter] for many years could experience problems with their liver or kidneys and may have an increased risk of getting cancer. The EPA recommends granular activated carbon (GAC) for the treatment of pentachlorophenol. Sources: EPA, WHO, Photo: WikiMedia, author: Vermont Timber Works Inc.